Scientists at Yale's Gerstein lab had an amazing dataset that they wanted to make more shareable and explorable for scientists. 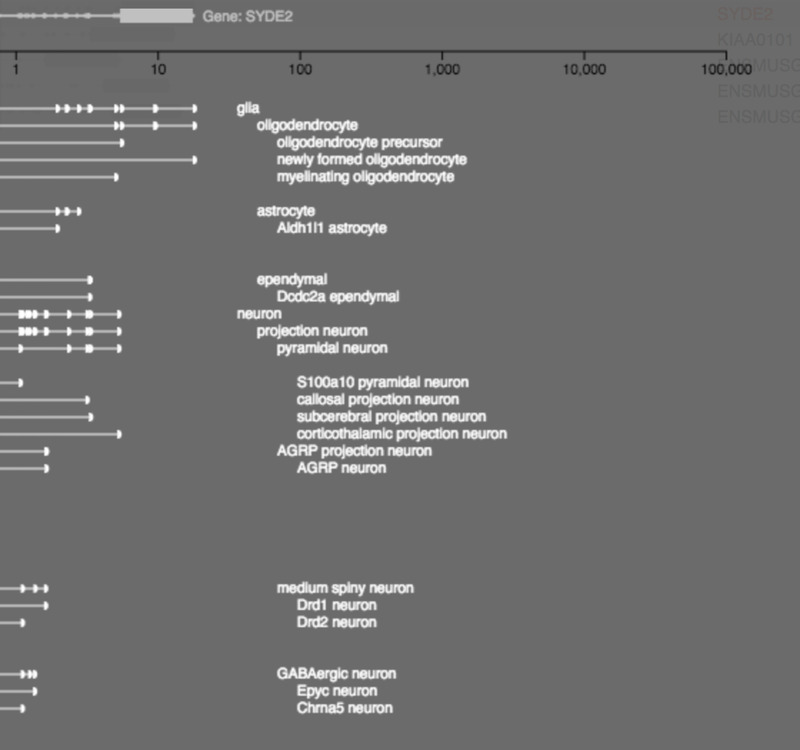 This dataset was particularly special because it included quantitative measurements of how much genes in the brain were expressed, and had these measurements by cell type. I built a working prototype of a tool in which a scatterplot plotting all the genes by two key quantitative values can be used to drive selection and filtering on the sortable table of genes below. This is combined with a dendrogram of cell types, defined at various levels of specificity, that can be used to highlight genes on the scatterplot and filter the table. Selectable dendrogram of celltypes, highlighting or clicking on a celltype colors the dots in the scatterplot blue or orange and filters the table below. Both the scatterplot and dendrogram serve to filter the table below. Each line of the table has a mini 1-d chart showing the expression levels of that gene for all celltypes as dots. This mini-chart also has a rectangle representing the fold expression: the logarithmic difference in size between the most expressed and second most-expressed cells. The table also notes the gene's common name and the celltype. Hovering on the table reveals an even more detailed chart, with the 1-d chart expanded into one line chart for each celltype. Each dot is an expression level measured for that cell type. Indentation of the celltype names reinforces their level in the celltype hierarchy.